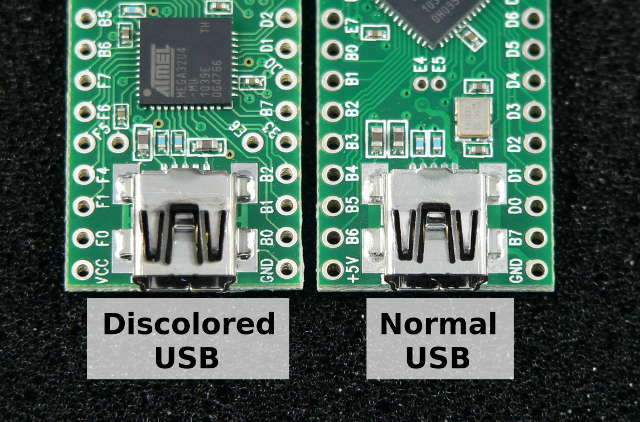 A recent batch of Teensy 2.0 boards had slightly discolored USB connectors. They have passed all testing, including programming the LED blink by USB, and they work perfectly fine. While they last, we're offering these boards at half price! Plenty of the normal Teensy 2.0 boards are in stock. Even the regular $16 price is lower than all other Arduino and Arduino-like boards. Hopefully you'll consider Teensy for a future project? A few months ago we switched to a different USB connector with much higher quality metal and plating. All normal Teensy 2.0 shipping since March 2012 have these higher quality USB connectors. Update: July 18, 3:29 PM (PDT): They've all sold. Orders after 1:38 will be postmarked July 19. Update: July 18, 1:38 PM (PDT): 108 pieces left. The postal carrier just picked up today's packages. We expect to run out by the within the next couple hours. If there is stock for your order, you'll get a shipping notice today, and your package will be postmarked July 19. Update: July 18, 8:30 AM (PDT): 280 pieces are in stock.